What does a blood clot in the leg feel like? Painful, hot, 'crampy' and swollen. Blood clots, no matter where they are located, always need close attention. According to the Centers for Disease Control and Prevention (CDC), about 1 to 2 per 1,000 people in the United States is affected by this condition, which is an estimated total of about 900,000 individuals per year. The associated health care costs $10 billion or more each year in the United States. A condition where a blood clot is lodged in one of the veins in the body is c alled Deep Vein Thrombosis (DVT). The Cleveland Clinic reports that nearly 90 percent of all DVTs occur in the legs, and those that are in the thighs and upper legs, if left untreated, are 50 percent more likely to become pulmonary embolisms. This article will discuss the symptoms that may indicate blood clot in the legs. Symptoms may not be exact BUT awareness of the possible signs would greatly help in diagnosing. The pain normally starts in the calf and feels like cramping. Pain varies from dull to intensive level depending on the size of the clot. A physical assessment called Homan’s Sign Test can be performed to check for pain that could be related to blood clots in the legs. This is done by dorsiflexing the foot of the patient, pain or discomfort at the back of the knee or calf is a positive response. 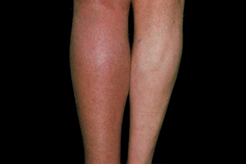 Swelling could be observed in the affected leg. It is very rare that both legs will swell, so the difference will be remarkable. One of the telltale signs that swelling may be clot-related is that it will not improve despite treatments like hot or cold compress applications or leg elevation. There is usually a visible discoloration of the skin as a result of collection of blood just beneath the skin surface; color may vary from reddish to bluish. These are persistent and will not go away over time but rather intensify and grow in size. The skin near the area may become warm to touch. This warm feeling is typically highly localized. Sometimes referred to as Charley Horse, these cramps are severe and start from the calf. This happens especially at night during sleep. • Move around as soon as possible after having been confined to bed, such as after surgery, illness, or injury. • Risk can be reduced by maintaining a healthy weight, avoiding a sedentary lifestyle, and following a good diet.